Get the physical benefits of Nordic skiing, without setting foot in the snow. 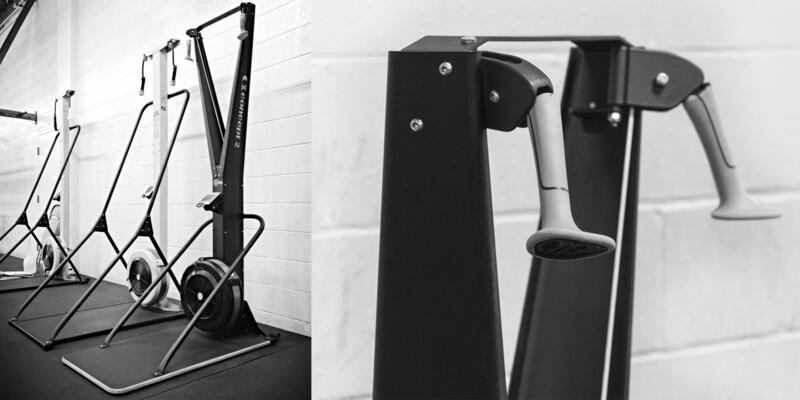 You may have seen the SkiErg machine at your gym: It basically looks like a rowing machine that’s been turned on its head, with two handles at the top and a flywheel at the bottom. But the question is, have you ever tried it? Or know why you should? We’re guessing no. So we asked Ronnie Allen, an Equinox Tier 3 trainer at 43rd Street in New York City, who uses the machine regularly as a go-to tool with his clients, for some pointers. “The SkiErg builds muscular and cardiovascular endurance, all while improving your balance, power and agility,” he says. “It’s perfect for people who are in a rush.” Allen recommends you spend just 7 minutes on the machine to start, working at a high intensity. Perform each move for 1 minute, moving quickly. You will do the Lateral Twist twice (once on each side). As you progress, you can add time onto each rep, or incorporate a rest at the end and repeat the entire circuit. Stand with your feet shoulder-width apart, about two feet away from the SkiErg, knees slightly bent. Reach arms overhead and grab handles. Pull both arms straight down, reaching back toward glutes, as you squat and hinge forward from hips, keeping back flat. Return to standing, lifting arms back overhead, and immediately repeat movement. Stand with your feet shoulder-width apart, about two feet away from the SkiErg, knees slightly bent. Reach arms overhead and grab handles. Perform the same pull/squat motion you did in the Double Pull, but this time, lift one foot a few inches off the floor with every pulldown. Alternate your balancing/lifted foot each rep, keeping knees soft throughout. Stand with your right side facing the machine, feet shoulder-width apart. Rotate torso to right and reach both hands up to grab the handles. Then pull handles diagonally across your body and over to the left as you squat, bending knees (like a wood chop). Smoothly reverse motion back to start and immediately repeat. Continue for 1 minute; switch sides and repeat. Stand with feet about shoulder-width apart, knees slightly bent. Reach arms overhead and grab handles. Pull arms straight down by sides and squat, bending knees, then as you lift arms back overhead, hop a few inches over to left with both legs. Immediately repeat, but this time hop over to your right as you lift arms overhead. Continue alternating sides with each rep. Stand with right leg extended and lifted a couple of inches in front of you, balancing on your left foot. Reach arms overhead and grab handles. As you pull arms down by sides, squat, bending right knee. Hop up and switch legs (balancing on right; left extended) as you lift arms back up. Immediately repeat. Move explosively as you stream together a combination (whatever you want to do) of all the moves you’ve already performed.